HYDERABAD: Sindh Police on Friday arrested a madrassah teacher who was captured on video beating his students that went viral on social media. 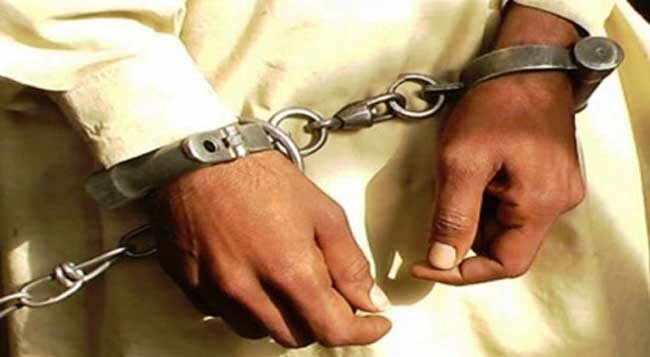 The detained, identified as Shabir Ahmed was arrested on the grounds of physical violence against his students to which he imparts religious education. “Shabir Ahmed s/o Ghulam Hussain by caste Ansari r/o Sarfaraz colony. Ghulam Hussain is a Pesh Imam in Sarhandi masjid and Shabir is Hafiz e Quran and teaches Quran-Pak in Sarhandi Masjid Arrested by SHO Cantt. Hyderabad” confirmed the provincial police’ official Twitter handle. Shabir Ahmed s/o Ghulam Hussain by caste Ansari r/o Sarfaraz colony. Ghulam Hussain is pesh Imam in Sarhandi masjid and Shabir is Hafiz e Quran and teaches Quran pak in Sarhandi Masjid Arrested by SHO Cantt. Hyderabad. In the video, the madrassah teacher can be seen hitting children with a hosepipe and arguing when asked not to beat them up by a man who had come to pray at the mosque. Furthermore, Sindh IG Kaleem Imam had sought a report from SSP Hyderabad regarding an inquiry into the matter and the action taken by the police in this regard. Meanwhile, Chief Minister Murad Ali Shah has also taken notice of the matter, directing Commissioner-Hyderabad to submit a report. In order to address issues of violence against children, CM Murad has urged the Education Department to initiate a counselling programme in collaboration with the Council of Islamic Ideology. “Violence against children is unacceptable at all costs,” he said.